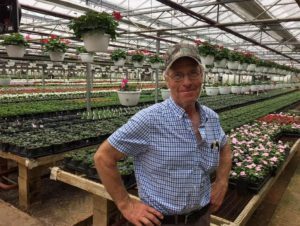 Doug Radebaugh of George W. Radebaugh and Sons, Inc. in his family’s greenhouse. The MEA team recently visited Doug Radebaugh of George W. Radebaugh and Sons, Inc. a florist and greenhouse business established in 1924 in Baltimore County. Utilizing a Maryland Energy Administration 2017 Kathleen A.P. Mathias Agriculture Energy Efficiency Program grant they were able to upgrade the energy curtains on two of their greenhouses, which is estimated to save 27,790 gallons of propane and approximately $18,000 annually. According to Doug Radebaugh, “fuel use is number two behind labor costs for us. When we can trim that cost, it benefits our bottom line while improving the quality and productivity of our operation. Upgrades like this are important to help us stay competitive and hang on to our 100th anniversary.” Doug is third generation to work for his family’s business, his son has also joined the team and we wish them many generations of energy savings and prosperity. This program is dedicated to the memory of Kathleen Arlee “Kathy” Petry Mathias of Ocean City, who passed away Aug. 15, 2011 after a battle with cancer. The wife of Maryland State Senator James N. Mathias Jr., Kathy was an inexhaustible advocate for Maryland’s Eastern Shore and its farming community.​​​​​ For more information on the Kathleen A.P. Mathias Agriculture Energy Efficiency Program, contact Dean Fisher at dean.fisher@maryland.gov or 410-537-4068.